Are you looking for a company for wood floor sanding in Ramsey, NJ? Majestic Floors wood floor specialists use up to date techniques, tools and equipment to get the job done and guarantee 100% dustless wood floors. Let’s face it: having your hardwood floors refinished can be pricey. It can often be tempting for many homeowners to try and do the job themselves, but in many cases, this is a mistake. Below are several situations when you should leave it to the professionals at Majestic Floors. Refinishing a hardwood floor is a time-consuming process with many steps. First, all previous fastenings, and anything that might disrupt the sanding process, must be removed. Then the floor must be sanded three separate times, with three different grades of sandpaper. Once all of that is done, the floor should be cleaned, stained, and sealed, all of which involve chemicals that you might not want around children and pets. Because the process involves so many steps, and can be hazardous, if you do not have the time to dedicate to the project, or you anticipate distractions, it is recomended to leave it to or wood floor experts at Majestic Floors. Engineered hardwood, unlike natural hardwood, has several layers of different components. As such, it is very easy to damage the flooring during the sanding process. Engineered hardwood often requires treatment with different chemicals as well, and our professional wood floor specialists will be aware of the different types of engineered hardwood and will be able to develop a plan that will protect your flooring. Your floors have to handle a lot of wear and tear, and replacing them altogether is far more expensive than having someone refinish them for you. 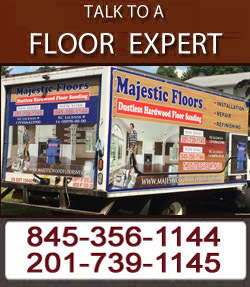 For more information about wood floor sanding in Ramsey, NJ, call Majestic Floors to speak to our specialists today!